Jubilee USA Network, Oxfam International and Americans for Informed Democracy called on the IMF to change their appointment process of the IMF successor. We called on the IMF to move away from a European "coronation" and towards an equal democratic appointment. "The IMF is a multilateral organization, not a unilateral one. Instead of a European coronation we need a legitimate selection process powered by global opinion," Eric LeCompte, Executive Director. One of Jubilee's interns creating the sash for the to-be queen of the IMF. The Jubilee Team worked with Oxfam International and Americans for Informed Democracy to create a successful event outside of the IMF building in Washington, DC. 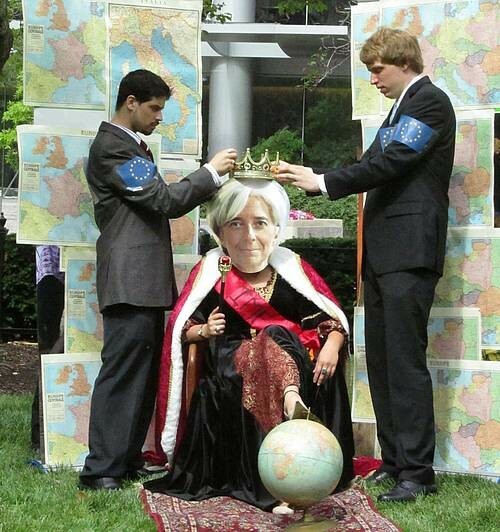 One of Jubilee's interns dressed up in a queen's outfit and a mask of Christine Largarde to demonstrate the unequal appointment system of the IMF. Christine Largarde was appointed the new IMF director but we will still push for a democratic world election instead of a European coronation.